Going the other way again, another quick Madrid attack starts at 2:45 (26′), and it comes up their left side again–the trio of Marcelo, diMaria, and Ronaldo combining well, for not the last time in the match. Marcelo picks up the ball off another poor Barça touch, plays a nicely weighted ball up to CR7 in the center circle. He takes a single quick touch to turn–the quickness of his feet is impressive–and with his second touch plays a surprising stretching diagonal through ball towards the far corner flag. That’s the space behind Dani Alves, and it’s diMaria who once again gets behind him and runs onto the ball. Note that when Marcelo plays the initial ball into Ronaldo, diMaria is just about even with Marcelo, just inside their own half, with Alves ahead of him. But Ronaldo’s ball is just in the right place behind Alves, and diMaria has the jets to beat Alves to the spot. Usually Alves can rely on his speed to recover and catch whoever’s he’s ostensibly supposed to be marking–but that’s not always the case with diMaria. But back to diMaria and Alves. In fact Alves is able to recover and gets back in front of diMaria to prevent a cross, allowing defensive help to arrive in the form of diMaria’s fellow Argentine Javier Mascherano. Mascherano does well to tackle, recover possession, and with another touch start a Barcelona counterattack back up the same wing. It’s Pedro who’s on Barça’s right attacking wing now (having switched sides with Villa). 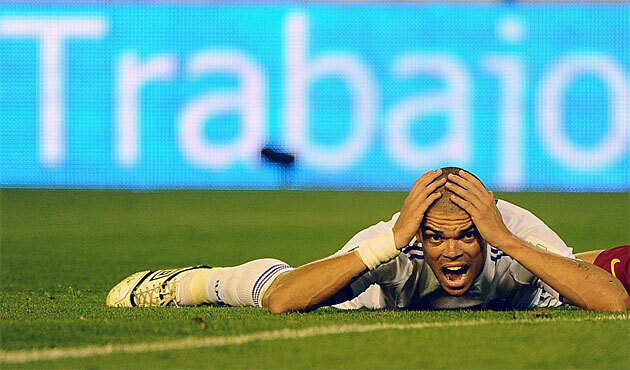 Mascherano’s ball puts him behind Pepe, who’s called for foul him and draws a yellow card as a result. That first yellow card leads to a stretch of nastiness. A couple of conflicts between Madrid defenders and Barça forwards (Arbeloa and Villa, Carvalho and Pedro)–both, interestingly, resulting from Barça uncharacteristically trying to play long “route one” balls over the top–which lead to a couple more yellow cards and a couple scrums. Madrid counters again in 36′ (5:10 in the clip), after Pique steps forward to intercept but misplays the ball. Again it’s Özil who creates for Madrid; he snatches the loose ball and the break is one–one touch to move forward, his second touch putting Cristiano through. With Pique caught up and out of position, it’s Busquets who’s chasing–and as the commentator notes, CR7 has Busquets beat for pace. But Busquets does decently to keep Ronaldo on the outside, but he gets a good shot on goal, well-saved by Barça goalkeeper Pinto. But take a look at what happens off the rebound: it falls to Busquets–who attempts a cheeky pullback right in front of his own goal. Barça doesn’t pay for it here, and instead wins a free kick after Pepe punishes him; but it’s another instance of shaky play from Busquets, something Guardiola cannot be happy about. But the best chance of the 1st half comes shortly after (5:53; 44′). Somehow Pique is again caught up far forward and loses possession, and Madrid immediately counters. Arbeloa hits a long ball over the top–and it’s again it’s Özil on the ball, run into the space in the flanks. Pinto does well to come out of his area to clear, but the threat isn’t over, and once again it’s Ozil and Ronaldo behind it. The two combine with an impressive bit of volleyball over a couple Barcelona defenders off the ensuing throw-in (note also how Cristiano sprints forward to take the throw quickly). Ronaldo throw to Ozil’s chest, who dinks it back to him; he shoulders it back to Ozil, who chests it down–and then the genious of Turkish-German is displayed again, as he suddenly changes the scale of play. Four Barcelona defenders have been sucked into the vicinity of this Özil-Ronaldo tea party, leaving Dani Alves alone in the box. Özil perhaps sensing this (that instinct again) swings a cross into the box. It’s Pepe who has drifted forward this time, creating a height mismatch, and he attacks the cross with ferocity–only to see it hits the inside of the post and bouce back across the mouth of goal! Pepe: "No lo me creo"
Overall, it’s a fantastic sequence illustrating Madrid’s tactics in this match: counter quickly and decisively into the space behind the Barça defense, particularly when the latter get caught forward out of position–and then look for service into danger areas, where odds are the height advantage will be in Madrid’s favor.